Engineers constructed a high-speed simultaneous multi-view (hs-SiMView) microscope, capable of taking images of anatomy on microscopic scales and recording the firing of neurons by capturing images five times every second. Using the new equipment, the researchers were able to capture more than 10,000 neurons firing in Drosophila larvae while the central nervous system was artificially excited in patterns that mimicked crawling backward and forward. The aim was to understand how high-order control centres in the brain coordinate basic movement. 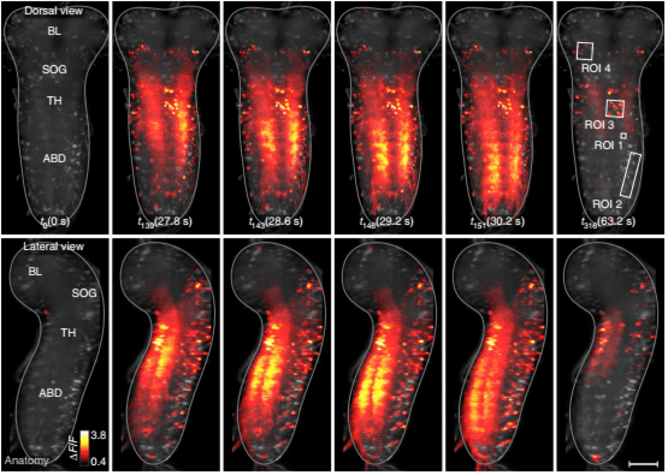 The results were functional maps of neural networks in the fruit flies, highlighting how individual neurons were connected and how their firing patterns controlled movement.